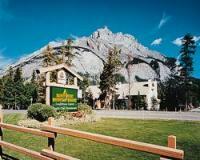 Banff Rocky Mountain resort is affliated with both RCI and II exchange companies and is located in a spectacular setting within Banff National Park. The resort features a fitness club with exercise equipment, squash, indoor pool, indoor/outdoor hot tubs and restaurants. Winter offers downhill skiing at Sunshine Village, Mount Norquay, and Lake Louise; cross-country skiing in Banff National Park; heli-skiing in the Bugaboos; and sleigh rides. Summer offers heli-hiking, area hot springs, fishing, golf, horseback riding and boating. To top it all a myraid of shops and restaurants await visitors in the town of Banff.